Well, well, well... Look who's back in town... Rich Guy! The dude (another one of his nicknames) seems to come and go. Well, it's nice to see him again; but in all honesty, there is something more important to his return. Yes, it could only mean one thing - more eating! When both of us lived in Yaletown, we would meet up with Vandelay frequently for lunch (since he worked there). But those days are long gone (well, I do try to buck the trend...) due to change of residence and having kids. No, the carefree lifestyle is permanently in the rear view mirror. So with our busy schedules, it didn't look good for any meeting of any sort. Ah, when there is a will, there is a way! Seeing how Rich Guy had to pickup a Sony Walkman I had helped him purchase on boxing day and the fact I had to pay Vandelay a visit to borrow his parking pass (to see all the sights and sounds of the Olympics in Downtown), I devised a plan. The plan was for Rich Guy to come over to pick me up and head over to Vandelay's place. Then, we could go out for some late night eats... on a Monday. Hey, whatever works! Vandelay suggested we go get some Izakaya since we'd all eaten dinner already. 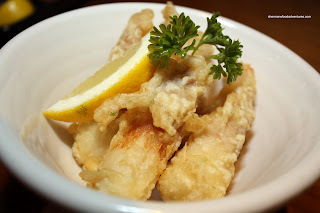 I originally thought we should try out Manzo; but he had a better idea, which was Nan Chuu. I have heard of Nan Chuu before; but for some odd reason, I didn't know it was run by Gyoza King. Well, that was welcome news since I love Gyoza King! And just like at Gyoza King, Vandelay went for 2 of his favourites which were the Large Green Salad and the Chikuwa Cheese. Normally, a green salad would evoke as much excitement as watching a rerun of the new Knight Rider. However, there is something about this "secret sauce". A generous amount of this slightly citrusy dressing lay hidden underneath the fresh slices of cucumber, tomatoes and mushrooms. For some strange reason, the chikuwa cheese was not very crispy. The batter was bordering on mushy. At least the chikuwa had a nice chewy/springy texture with cheese oozing out of the middle. Rich Guy's choices were the Gyu Tataki and Marinated Salmon. 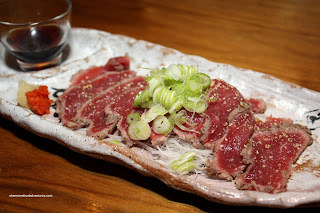 I have to say the tataki was probably the best dish of the meal with tender slices of meat accompanied with a citrus ponzu shoyu. Unlike the one I had at Irashai recently, the thin slices of meat needed barely any chewing. 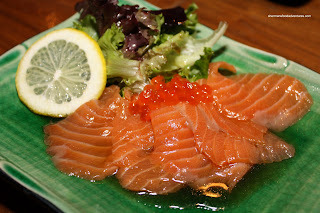 The salmon was a bit sweet and slightly tart from the shoyu vinaigrette. It had a nice buttery consistency and merely melted in our mouths. For my choices, I convinced them that we needed 3 more dishes and they wholeheartedly agreed. Such compliant dinning companions! I opted for the Takoyaki, Ebi Mayo and Usugiri Gyu Tan (Grilled Beef Tongue). 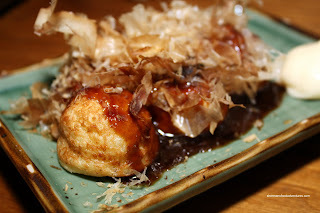 The takoyaki was pretty good being soft and fluffy (maybe a tad too soft) with a good amount of bonito on top. There was just enough sauce and a side of mayo accompanying it. 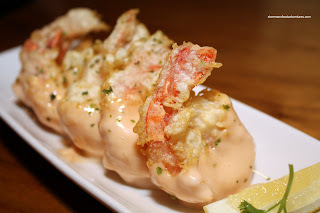 I thought the ebi mayo was fantastic. Unlike the one I had at Hapa Izakaya Yaletown a few weeks ago, these ones were crisp (where there wasn't any mayo) and the prawns were cooked perfectly. A tad heavy on the mayo; but it did taste good nonetheless. 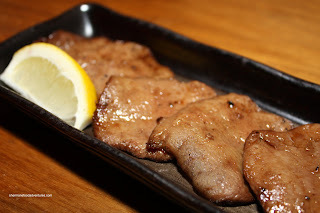 Naturally, I would gravitate towards the grilled beef tongue because you can never get enough tongue... I think Viv is getting tired of this joke... Seems like Rich Guy and Vandelay didn't mind getting tongue either (geez, that doesn't sound right). We ended up with the thinly sliced version and it really helped enhance the experience. Otherwise the thick cut would've been a bit hard to chew. These ones were still chewy; but pretty easy to eat. Taste wise, they were butteryish since tongue has a high fat content. As expected, with Nan Chuu being run by Gyoza King, the food was solid and the prices were reasonable. In addition to Guu, I think that Gyoza King and Nan Chuu are the best combination of quality, taste and price when it comes to Izakaya in the GVRD. Yah, the salad was very good. 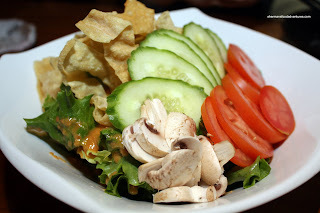 In fact, the dressing makes this salad. Well, in addition to the fresh veggies that is.